Bike Camp Discount for Kidical Mass Kids! As summer nears an end, (shh, don’t tell the kids!) we have a few spots remaining in our Bike Camp program. We’d like to offer the friends and families of Kidical Mass a discount on these remaining spots in case they are interested in squeezing in a week of bike camp fun before school starts. With the discount code “happysnowman,” friends and families will receive $90 off registration, bringing the registration price down from $290 to $200 for a 5 day camp. Please feel free to pass this along to anyone who may be interested. Groups of 12 campers with ride with their 2 instructors to boldly explore Portland and it’s many parks, fountains, bridges, gardens, and rivers. By the end of the week, they’ll learn group riding etiquette, hand signals, simple bike repairs, and leave camp as confident riders. For more information, please visit www.communitycyclingcenter.org and please feel free to contact me with any questions. Author Katie ProctorPosted on August 7, 2015 June 12, 2016 Categories DefaultLeave a comment on Bike Camp Discount for Kidical Mass Kids! This year’s peep parade will go from Overlook Park to Arbor Lodge park, where we’ll finish up with an awesome easter egg hunt. Author Katie ProctorPosted on March 24, 2015 Categories DefaultLeave a comment on Peep Parade! Planning Meeting for the 2015 ride calendar. Former leaders, future leaders, the leader-curious, interested parties, community stakeholders, and friends of KM all welcome. Bring: YOUR 2015 events calendar. A laptop or other internet-connected device. Ideas, dreams, and wishes for Portland’s Family Biking Community. Your best can-do attitude. 1) Visioning: What do we want Kidical Mass to be in 2015 and beyond? 2.5) Collaboration: How can we work with Go By Bike Shop, with Timo’s Portland By Cycle rides, with Portland Sunday Parkways, and others? 3) Planning: What WILL we do for each month? Who will own the event? What are next steps? We are excited to welcome new blood, new enthusiasm, new ideas, new collaborators to come to the table. If you are a long-time Kidical Mass-er, please come. If you are a person who bikes with your kids, please come. If you are a person who does bikes and has kids but aren’t sure how to put them together, please come. If you are a person with a business or community role that makes Kidical Mass interesting or relevant to you, please come. If you are a grandparent/aunt/uncle/mentor/friend to children who need more biking in their lives, please come. If you can’t come but have ideas that you want to share before the meeting, please PM me about meeting next week, or send me an email. It’s back! Once again, Kidical Mass will celebrate the spooky season with a costumed ride to the annual Thrill the World PDX mass zombie dance performance. We will meet at the new Dawson Park on October 25 at 1:45 and depart at 2 for a meandering loop around the neighborhood, ending at Irving Park to watch the dancers at 3. Been practicing your moves? Get your zombie makeup on and join in! This ride is NOT a loop, but will likely conclude with drinks and snacks at Hopworks Bike Bar. Kids must wear helmets. Bring lights in case you wind up out late. Bring treats to share if you’d like. And wear your Halloween costume. RSVP at the Facebook event here, or just show up! A one-way Kidical Mass Ride from Alberta Park to SE Sunday Parkways. 11-ish arrive at the SP route near 16th & Ankeny, continue rolling as a group to Col. Summers Park or beyond! As always, we ride on open streets, kids must wear helmets, be able to ride in a straight line, and follow verbal directions. 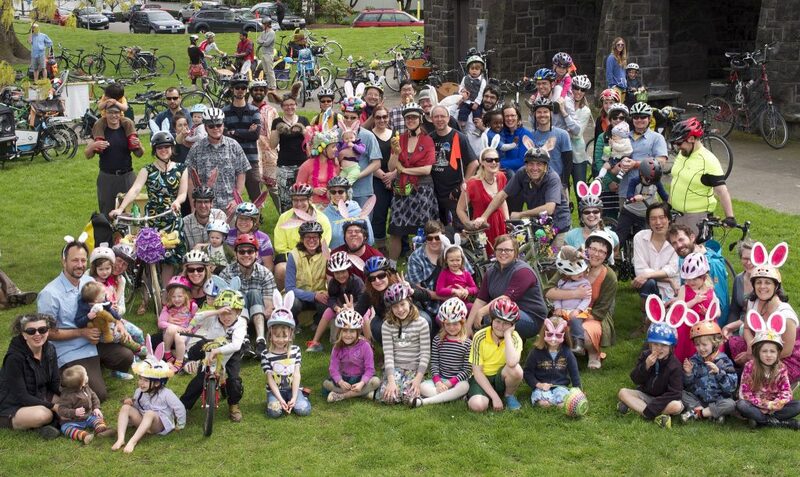 It’s time to dust off those bunny ears and shine those Sunday shoes for an Easter Sunday bike ride and easter egg hunt for the little Peeps in North Portland! Kidical Mass will lead the Peep Parade from Overlook Park through quiet neighborhood streets up to Arbor Lodge, where the egg hunt will take place. The route is 3 miles, and not a loop, and as always, the roads will be open to traffic. We’ll congregate at the playground at Overlook Park and depart at 1:00 pm, heading north on Interstate Ave for one block (there are tracks to cross here, so please take caution), and then will turn west onto Overlook Blvd, and then head north on Concord Ave. We’ll continue over Going St. via the pedestrian bridge, and then head west on N Willamette Blvd. The parade will follow the bluff to N Knowles, and then head east on N Bryant St to Arbor Lodge Park. The location of the easter egg hunt at the park will be revealed by the ride leaders upon arrival. We will stay together as a group and follow all traffic safety laws. Helmets are required for children and encouraged for adults. Kids riding their own bikes and should be able to ride in a more or less straight line, stop and start as necessary, and follow verbal directions. Joe Biel has been working on Aftermass: Bicycling in a Post-Critical Mass Portland for several years. He interviewed me for that project, but when the footage didn’t fit the overall narrative, he made it into a short film instead. Just like way back in ought-ten, we will once again pedal to watch zombie dancers perform Michael Jackson’s Thriller en masse with Thrill The World Portland, this time at Irving Park. This month marks the third anniversary of the birth of Kidical Mass PDX. Just like way back in ought-ten, we will once again pedal to watch zombie dancers perform Michael Jackson’s Thriller en masse with Thrill The World Portland, this time at Irving Park. Ride assembles this Saturday (10/26) at Grant Park at 1:00pm. Get there early if you want time to play. It’s a 2-mile ride to watch the dancers in Irving Park at 2pm. So far this ride is planned as a one way. We can decide as a group if we want to loop back to the start, go for ice cream afterward, get food/drinks, or something else. We will do our best to make sure you’re not left stranded in unfamiliar territory. We ride slow enough for beginning riders, and won’t leave anyone behind. Kids should be able to follow verbal directions, ride in a reasonably straight line, and stop/start as needed. Kids must wear helmets… it’s the law. Lights are a good idea this time of year. Wear costumes! Bring treats to share! No need to register… just show up.